As I am not a member of the Mayor’s Executive Policy Committee, I was not involved at all in crafting and balancing the City of Winnipeg’s 2018 Preliminary Budget. This is important to note as I now am reviewing the budget in detail and am having meetings with the Public Service to gather additional information. Prior to being elected, I was asked by the City of Winnipeg to sit as an advisor on the first phase of Rapid Transit. And as a mom of teenage boys who use transit as their primary source of transportation, I am well aware of the challenges our City currently faces. Budgets are set to work within a specific allocation of funding. Again, I was not part of the budget group that established the priorities. To recap, I was not involved at all in crafting and balancing the City’s 2018 Preliminary Budget and am reviewing the budget in detail. 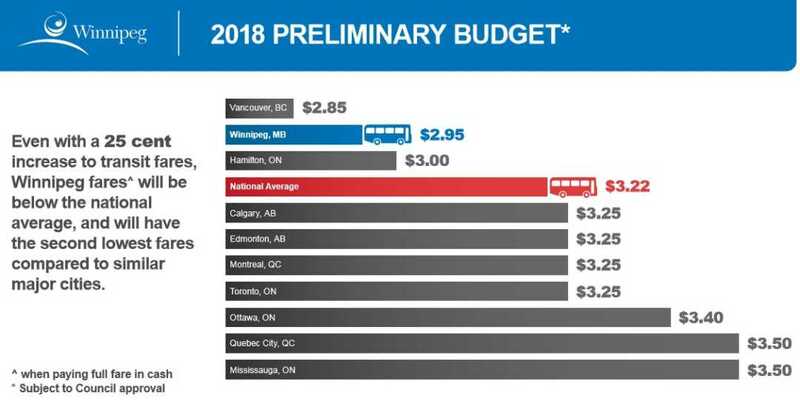 PROVINCIAL TRANSIT FUNDING: Is it a cut – is it a freeze?? We are receiving a set amount of funding that we must work within. Again, I go back to what budgets are about: We have to work within a specific allocation of funding and a budget represents City priorities. FARE RATES: See the two tables below, reflecting how Winnipeg’s fares compare across Canada. I am confirming when the last fare increase occurred (other than for the rate of inflation). 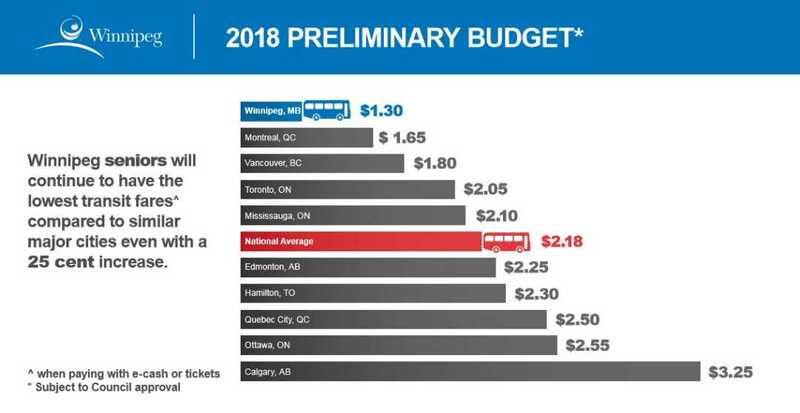 When I review rates across Canada and know any fare increase will be dedicated solely to transit, I can support a rate increase of 25 cents, which will generate $5M in funding to support transit service in Winnipeg. REDUCED FREQUENCY on CERTAIN ROUTES: This is being studied over the next six months, and nothing will come into effect until June, 2018. I am aware of multiple routes that have a very low uptake. It is wise to look at the lower performing routes and consider how changes can be made to existing routes to increase bus load capacity. LONG TERM STRATEGIC PLAN: Winnipeg Transit’s last Strategic Plan was conducted 17 years ago – SEE Directions for the Future. The Transit Director e-mailed me in June, 2017, and stated $100,000 was being dedicated to developing a Strategic Plan. Winnipeg is growing, and we want to have more people using transit. However, the current Transit service, performance and service levels are nowhere near what we should be delivering to citizens. Our transit network has been plagued by unreliability, bus drive-bys at stops, overcrowding and infrequency for years. There is no question in my mind that Winnipeg Transit needs a major overhaul. Transit is an integral part of a robust economy, and I strongly believe we need more buses AND more frequency. I am very pleased there is going to be a formal study into how we can begin overhauling our network through the development of a strategic plan. RAPID TRANSIT CORRIDOR IN 2020: Once Phase 2 of Rapid Transit is up and running in 2020, many existing routes in South Winnipeg will be changing to feed into the new corridor. 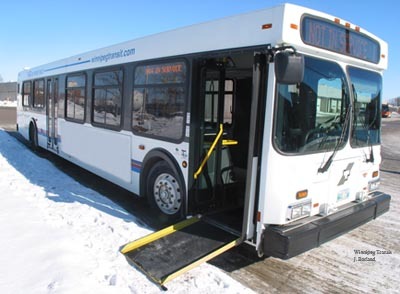 For details re route changes, see Transit Service in South Winnipeg on my website. PROVINCIAL CARBON TAX REVENUE: The Province of Manitoba has not yet stated specifically where the new Federally imposed carbon tax revenue will be applied. I am going to hold optimism that some revenue will be applied towards Winnipeg Transit, and will be advocating for that. I encourage you to contact your Member of the Legislative Assembly and do the same. I appreciate your e-mails, phone calls and concerns about transit. I share serious concerns also. Transit MUST be a PRIORITY – for many many reasons, but most importantly – to get people to work, to make appointments, for the environment and to grow the economy. I will cast my vote for the City’s Preliminary 2018 Budget at the Council meeting on December 12, and will be continuing to gather additional information between now and then.